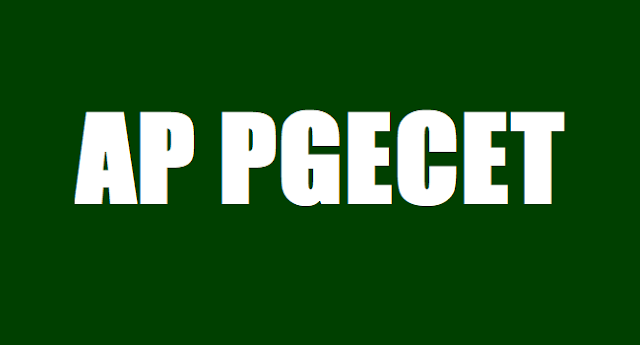 AP PGECET 2019 Results, Rank Cards, Answer keys download: Post Graduate Engineering Common Entrance Test (AP PGECET) is AP State Level Common Entrance Test for admission into Regular PG Courses in Engineering, Technology, Pharmacy (ME / M.Tech./ M.Pharmacy ), Graduate level Pharm-D (Post Baccalaureate) for the academic year 2019-2020 conducted by JNTU, Kakinada on behalf of A.P. State Council of Higher Education (APSCHE), a statutory Body of the Government of A.P. 1. Commencement of online applications: ...-03-2019. AP PGECET 2019 Results: JNTU, Kakinada issued the Post Graduate Engineering Common Entrance Test/ PGECET 2019 notification in March 2019 and the JNTUK invited the Online application from ..-03-2019 to ...-04-2019 from the eligible candidates for appearing the post graduate engineering common entrance test 2019 for admission into ME/ MTech/ MPharm / MArch/ Graduate level Pharm D Full Time in University and Affiliated Engineering / Pharmacy Colleges in Telangana State for the academic year 2019-2020. The candidates who were applied for this entrance exam stream, they were appeared the entrance exam, which were held from ...-05-2019 to ...-05-2019 and they are waiting for their results. The JNTUK will release the PGECET results on June 05 and results will uploaded on its official web portal. Candidates can check their results from this web site. AP PGECET 2019 Results, Rank Cards download to be announced...............: The results of APPGECET-2019 would be announced at Dr. Y.V.S. Murthi Auditorium, Andhra University College of Engineering on Monday at 5 p.m. According to a press release here on ................-05-2019, HRD Minister Ganta Srinivasa Rao will release the results and later it will be uploaded on the websites: www.sche.ap.gov.in/pgecet and www.andhrauniversity.edu.in. The results for the Andhra Pradesh Post Graduate Common Entrance Test (AP PGECET) was released on May ..., 2019, on the official website sche.ap.gov.in. The AP PGECET was successfully conducted by the Andhra University, Vishakhapatnam, on behalf of Andhra Pradesh State Council of Higher Education (APSCHE). The exam was held from May ... to May ... for all the candidates who are seeking admission into the postgraduate degree courses in the state. All the candidates who appeared for the examination can now check their results on the official website which is scheap.ap.gov.in. Step 4. In the AP PGECET 2019 Results/ AP PGECET 2019 Rank cards Page, Enter your Hall ticket number along with your date of birth in the required field. Rank secured in AP PGECET along with percentile and score secured by the candidate. The qualifying status of the candidate. "AP PGECET 2019 Answer keys: Answer keys"
Paatashaala is the best site to know the complete information regarding the government job notifications and educational notifications in AP and Telangana states.